It’s almost the weekend! Hooray! And it’s looking to be yet another glorious weekend here in Colorado. Shocking, I know. It’ll be an even better weekend because my parents are flying in today! I haven’t seen my folks since October, and not properly since last May. I can’t wait for them to see our new home in Denver and meet their fur-grandchild, Rocco! Because I am in such a delightful mood, I wanted to list some of my favorite things this week. I know this is a big blogger must-do, so I am jumping on that bandwagon for all it’s worth. Fridays seem to have that effect on people – we bask in what makes us most happy! So, here I go! Sooooo pretty. They arrived yesterday! I have been obsessing over these shoes for the past few weeks ever since I received their e-mail. With a race on Memorial Day, I thought it’d be fun to work the patriotic angle. 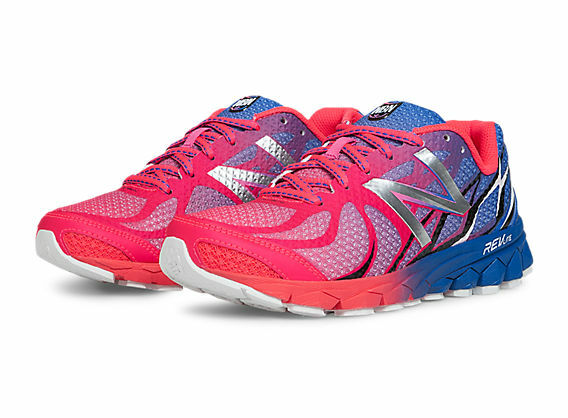 And now that I know NB 3190s are my all-time favorite race running shoe (i.e. Disney Princess Half Marathon, Lucky Laces, and soon to include the Nike Women’s Half Marathon), another pair is definitely in order. To piggy-back on Samantha’s choice from last Friday, SPARKLE SKIRTS! I love sparkles. I love skirts. I love running in skirts. I love being sparkly all the time. 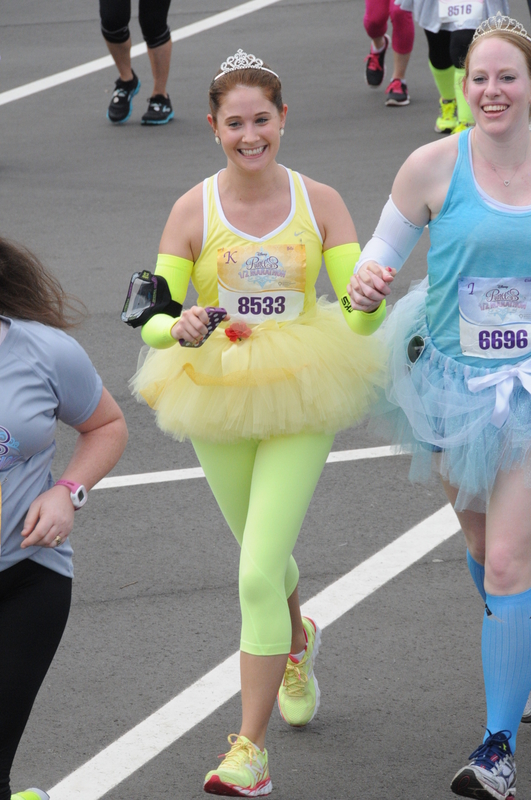 Therefore, I love running sparkle skirts. Samantha and I will be donning our sparkle skirts for the BolderBOULDER next month! I knew I wanted to give sparkle skirts a try, but wasn’t sure when to test them out. I haven’t yet been brave enough to don them solo, but when running with a friend, it seems the perfect excuse. The Bake N’ Burn Bombshell and I will be sparkling our way through the BolderBOULDER. Oh yeah. Spring in Colorado – duh! It’s amazing this time of year, and I love how much folks in this state enjoy where they live. It’s adventure season, as my coworker, Kaitlin said to me. And that is the plain and honest truth. So what’s on the docket? Exploring Colorado Springs (don’t you like my play on words?). This weekend the parental unit will be joining the hubs and I on a little southern outing. We plan on taking the Pikes Peak Cog Railway up to the tippy top (oxygen bar thankfully included), meandering through the Garden of the Gods, and new on my list, Cave of the Winds. Having been able to enjoy Denver and Boulder, it’s time to go south! Planning for England and Scotland! The hubs and I finally got down to planning business for our trip this September to the British Isles. We’ll be staying in London for eight days and Edinburgh for four, with a bunch of day trips scattered throughout. We finally booked our hotels and are looking into options for day trips and other reservations. I cannot wait!! This will be the hubs’ first time across the pond. He loves golf, gin and Scotch, so he’ll fit right in! 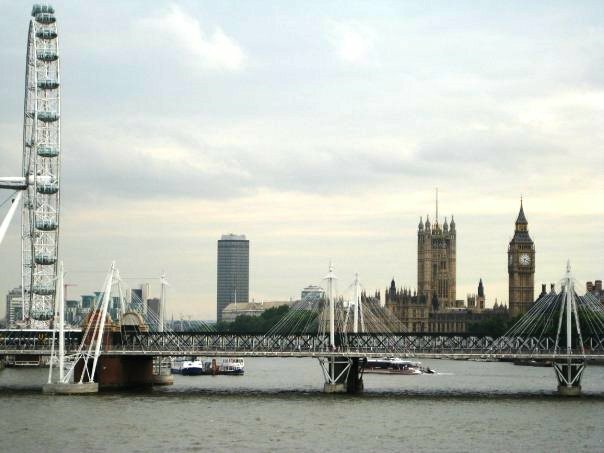 I can’t wait to return to London after 6 years away. It’s one of my favorite cities in the world. We hope to do a trip to Bath, Avebury and Stonehenge (Avebury is definitely better for viewing, but Stonehenge is pretty iconic, I guess…), Oxford, and maybe Canterbury. In Scotland, we’re planning to get in some golf (I have some serious practicing to do…) and a Scotch tasting/tour. All I know is that I absolutely cannot wait! More races! 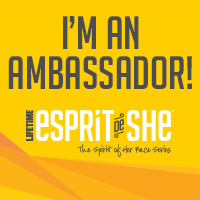 In the spirit of race season, I signed up for more races! I live to run! Particularly in adorable costumes! Last year I attended a wedding back in Maryland while a number of my Colorado sorority sisters ran the Denver Hot Chocolate Run. It gives you the option for a 5K or 15K, and looks like an absolute blast. It’s one race series that has always piqued my interest. 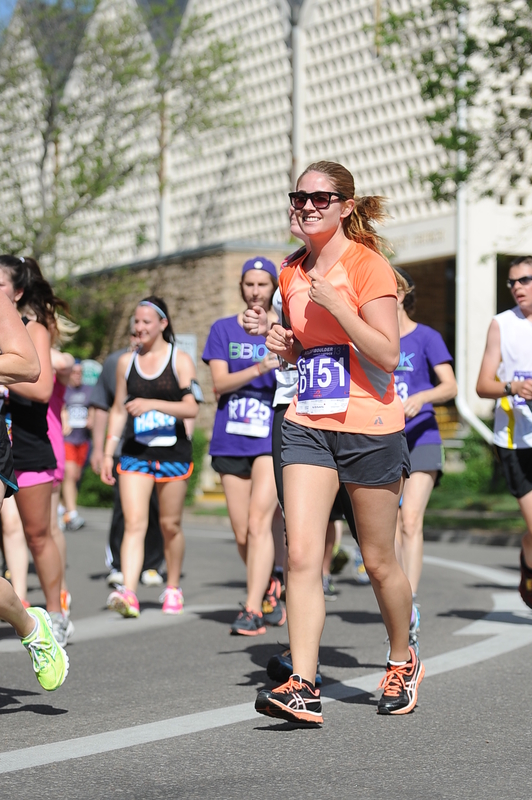 I signed up for the 2014 15K this upcoming October, and I know it’ll be so much fun! After reading about the Bake N’ Burn Bombshell’s Rock ‘N’ Roll USA experience, I knew I wanted to try an RNR of my own. 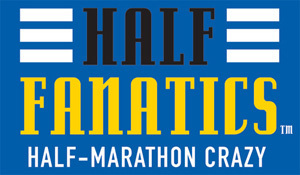 Luckily RNR Denver Marathon/Half Marathon takes place October 19th, and I am all over the half marathon. It’ll be my first half in Colorado (at altitude – ah!) and I think this will race will be the one to do it! My ultimate goal is to run 10 races this year, and I am currently set to complete 6. There’s a bunch of great local races I am looking into in June, July and November, so hopefully I can get 4 more on the books. Here’s to Friday and favorite things, and a great weekend ahead with family! What are some of your favorite things of the moment? Any upcoming adventures in your future? What are you most looking forward to this weekend? Have you ever run a Rock ‘N’ Roll or Hot Chocolate run – what did you think? 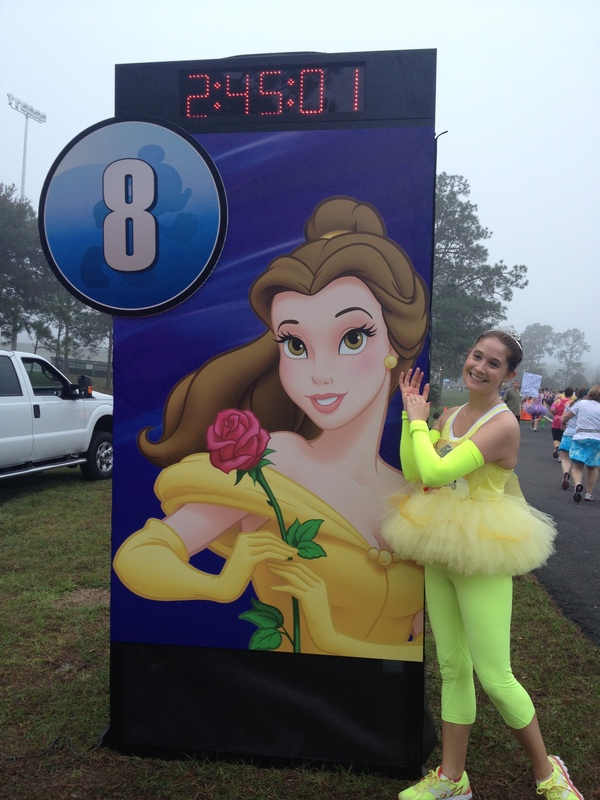 Perfect Princess Half Marathon Magic! *Cue trumpet fanfare* I am officially a half marathoner. I hope that’s a word, but if not, oh well! This past weekend marks my very first half marathon. Even better, it was in Walt Disney World. 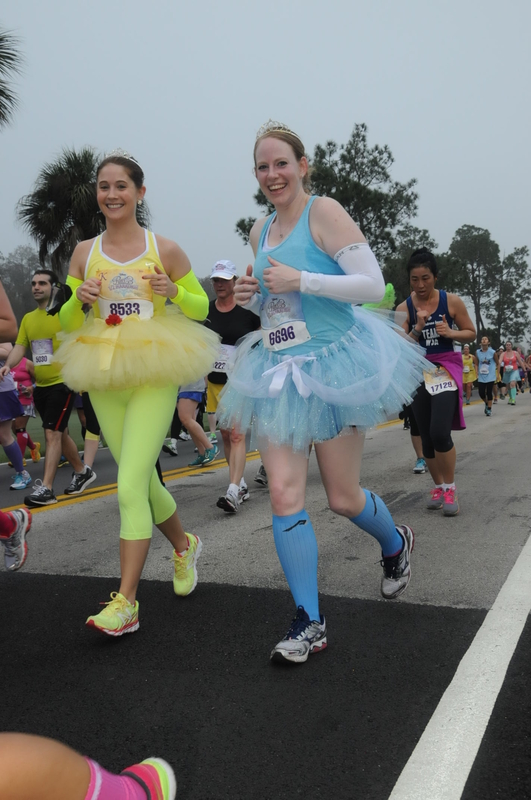 Better still, it was a Disney Princess themed half marathon. Genius. Having dreamed of being a princess from a small age (and coming to terms with the fact that I am a princess regardless of royal bloodlines and inherited tiaras), this was a dream literally come true. Running the race with my best friend was the only way to make it the best race ever run. To be perfectly honest, I didn’t truly know what to expect. Keeping in mind that this was a Disney event, however, helped me realize it would be a sensational spectacle and experience like no other. I maintain that if Disney took over the world, it would be a better place. Needless to say, it was glorious. If only they could also control the weather, but alas, some things are still just beyond our reach. I am pretty sure I was smiling like this the entire time. 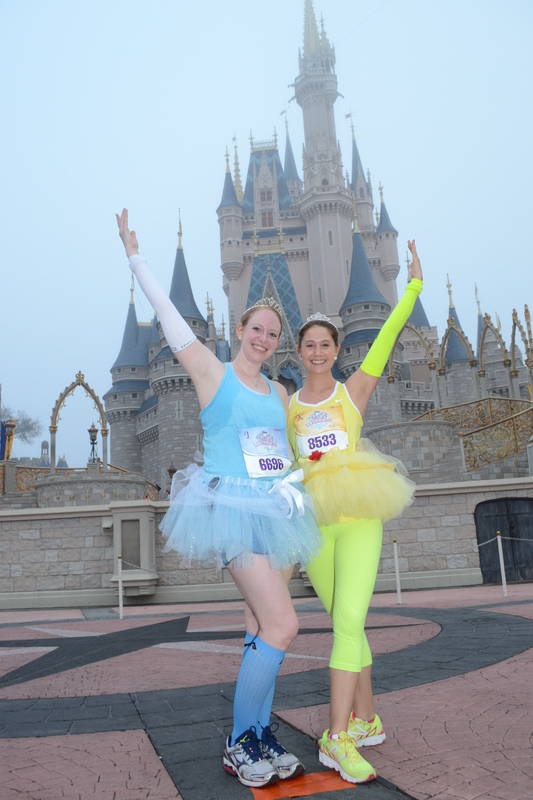 The weekend started with Friday with the Disney Half Marathon Weekend Expo. Because the Royal Family 5K took place Friday morning, the Expo actually opened on Thursday. Arriving a day after it first opening, you could tell it had already been slightly picked over. There were still plenty of products and merchandise to peruse and purchase. And boy did I purchase. How could I not? 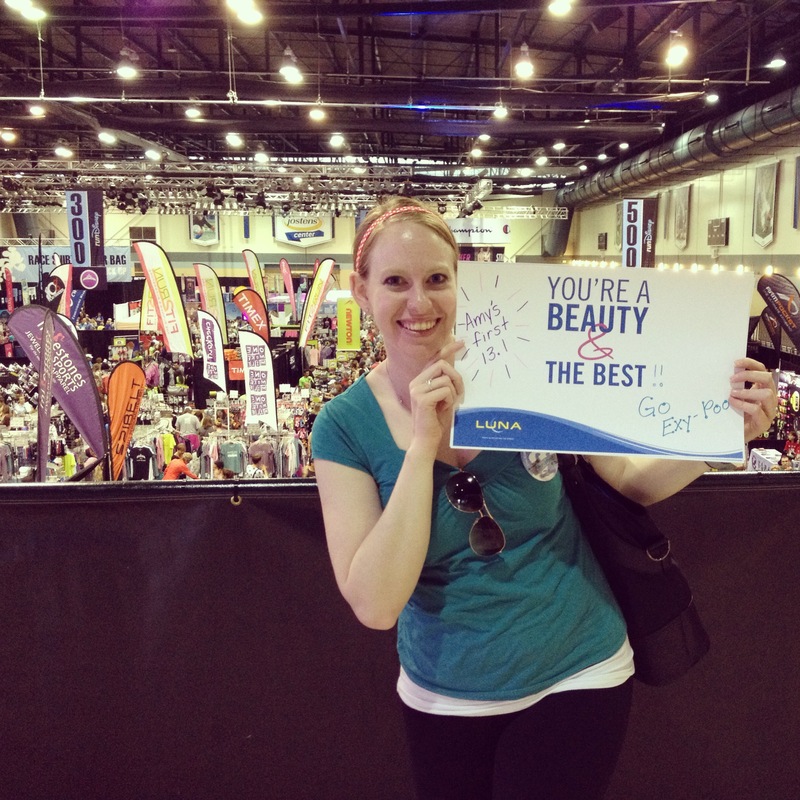 It was a massive Expo Center full of princess inspired athletic gear. I was in girly running heaven. 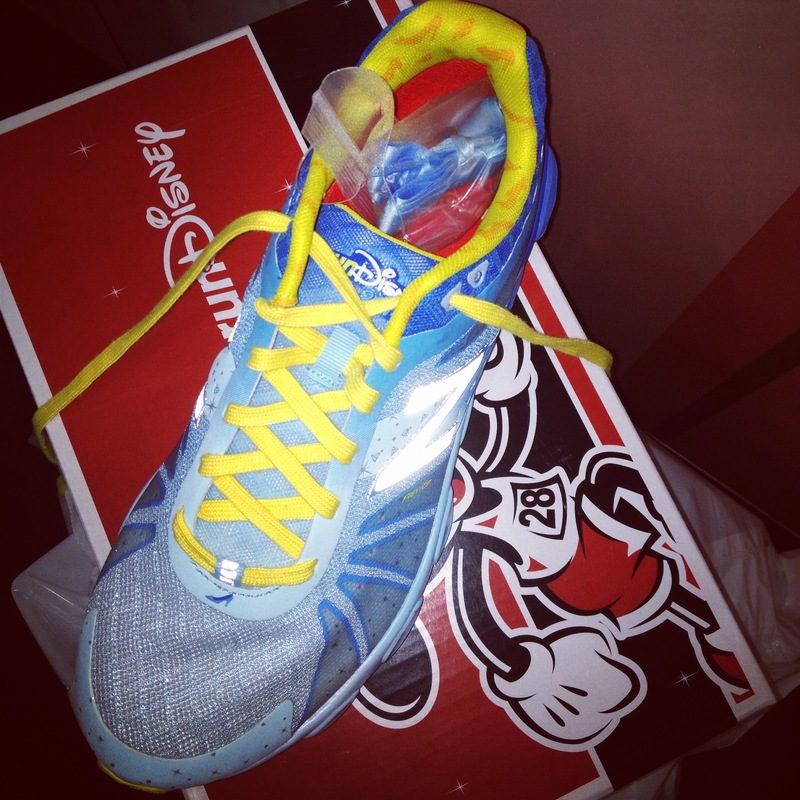 The piece de resistance, however, were the signature New Balance RunDisney (NB 860v4 and 890v4) inspired shoes. Of course I had my eyes on the Cinderella shoes. No detail was left unaccounted for: the glass slipper at the base of the laces, the pumpkin coach on the inside tongue of the shoe, the extra blue satin laces to “princess-ify” your shoes even more… And the list goes on. These shoes were perfect. The problem was that quantities were so limited last year and demand so high, that New Balance had instituted a pick-up policy. You were to sign-in online the day that you would be attending the Expo, beginning at 6:00am EST, and select a time slot in which to try on and purchase your shoes. Friday morning, my friend and I logged on at 8:30am and all time slots had been taken. We assumed we would be unable to purchase them, but would try again Saturday morning to select a time. I set my alarm for 5:59am on Saturday morning just to log-in, and got a very disheartening message: “Due to limited quantity of runDisney shoes we will be forgoing the online runner signup and on-site virtual queue process in favor of a first-come, first-served standy line. The standby line will form at the New Balance tent outside the Josten’s Center and we will begin accepting people when the Expo opens on or before 9:00am.” I felt right then and there our shoe dreams were dashed. Enjoying the beautiful chaos of the Expo! My friend and I wanted to do a short warm-up run Saturday morning, then leisurely get breakfast and get ready to head to the parks. We decided to just try for the New Balance shoes, and headed first to the Expo. At this point it was already 11:00am so we weren’t terribly hopeful. We walked right into the New Balance tent, found a representative, and were told there were shoes in our size and we could try them on right then and there. Now that’s Disney magic for you. So I can happily say I am the honored owner of Cinderella athletic shoes! Who needs a Fairy Godmother when you have magical shoes? Saturday we spent the day primarily in the Magic Kingdom, meandering through the crowds and enjoying a few of the sights. We rode Thunder Mountain (which I always forget is amazing), sipped on LeFou’s Brew at Gaston’s Tavern, commented on massive lines at Under the Sea and the Haunted Mansion, and found a fabulous tiara to don on race day. We ended the day back at the hotel and completed Christine’s tutu in preparation for the main event. Disney Magic at it’s best! Sunday morning we rose at 3:00am (just so you know, this was 1:00am MST…) and I was surprisingly energetic. 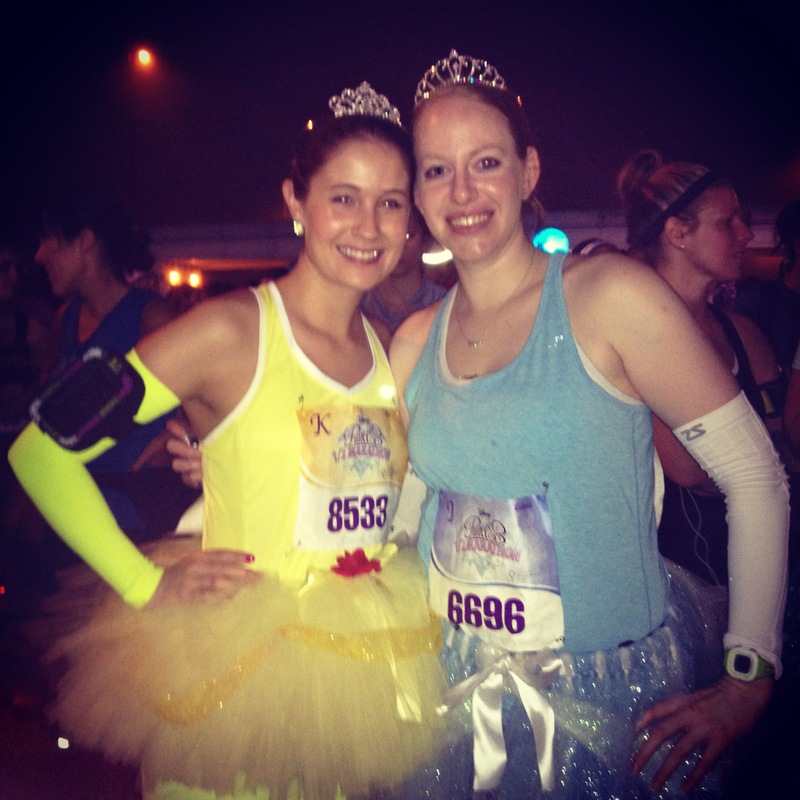 We got dressed in our terrific tutus and tiaras, attempted our best running princess faces, and headed to the bus stop. I cannot thank the running gods enough for the sheer luck of it all. Our resort was made up of numerous small buildings, rather than one large hotel. We were located almost furthest from the main building and dining hall, but just a stone’s throw to the first of 4 bus stops at the resort. Within minutes of arriving at the bus stop, the 4:00am bus drove up and picked up our group. Race planners had warned that the last bus of the morning would arrive at 4:00am. After our stop, there were 6 seats left, and a line of at least 30 people at the next stop. Many of the ladies there had been waiting 45 minutes or more. I had waited maybe 4 minutes… By the time we got to the third stop we had to turn on our lights and drive by slowly, indicating that there was no room. We didn’t even go to the fourth stop. We later heard that a few more busses arrived about 20 to 30 minutes later, but I cannot imagine having that amount of stress before having to run 13.1 miles. We made it to station, took some pictures, grabbed some goodies, and made the 15 minute walk to the corrals. We looked good for 5:30am. I was in corral K out of P, and I was thankful not to be last. Although you need to be lined up for the start at 5:30am, we didn’t begin our run until 6:00am. Corral K was full of life and cheer by the time we all made it to the starting line. “I Will Survive” blared over the speakers and we all sang along. Finally, we were given the go ahead and began our run with fireworks and fanfare. On the route you pass by costumed characters, high-flying kites, ChEAR Squad members with white-gloved Mickey Mouse hands waiting to give you a high-five (or would that be a high-four?). 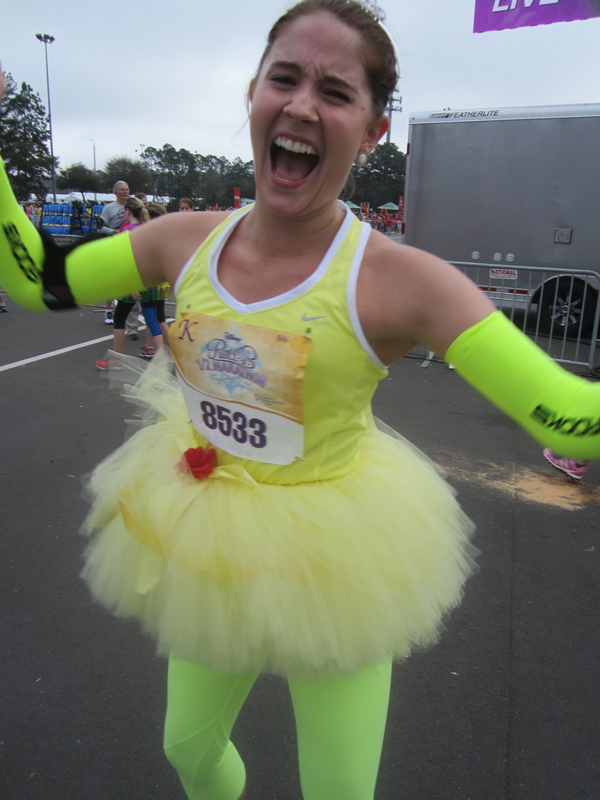 Music plays all along, and tutus abound. It’s really just an energetic, exciting race. Women, and men, of all ages, body-shapes, and experience levels crowd the course. It’s truly an opportunity for all to be a part of a magical moment. The start of the race is just outside Epcot. You run along the service roads, under the sign for the Magic Kingdom, traverse through a cast member entrance, and are suddenly transported onto Main Street USA. After making a congested right turn, the castle is in sight (well, it kind of was… it was really foggy). You run up Main Street and turn right into tomorrow land, where you loop behind Cinderella’s castle. Once you run underneath, there is a line of photographers waiting to capture this moment. Afterwards you make your way through Frontierland, and out another cast entrance. You follow more service roads along, until you return to the original course and head straight into Epcot. There you follow your way around Spaceship Earth and past the fountain, then back and through a cast entrance into the parking lot for the finish. To say that it was a surreal experience would be a massive understatement. Beside my favorite fictitious royal, Belle! This was possibly the best first half marathon you could do. Everything is perfectly thought out, and no detail is left unnoticed. I may have actually over-trained, given the amount of people walking and the congestion that can build up during the race, but it’s never bad to have built-in walk breaks. Besides, it gave me plenty of time to take ridiculous pictures along the way. I thought I would tear up more throughout the race than I did, but mostly I was exuberant and giddy. My friend told me I just had this little girl smile on my face the whole time. When I was given my medal, however, reality sunk in. I did it. And I cried. I was so gosh darn happy! And yes, we held hands as we crossed the finish line! 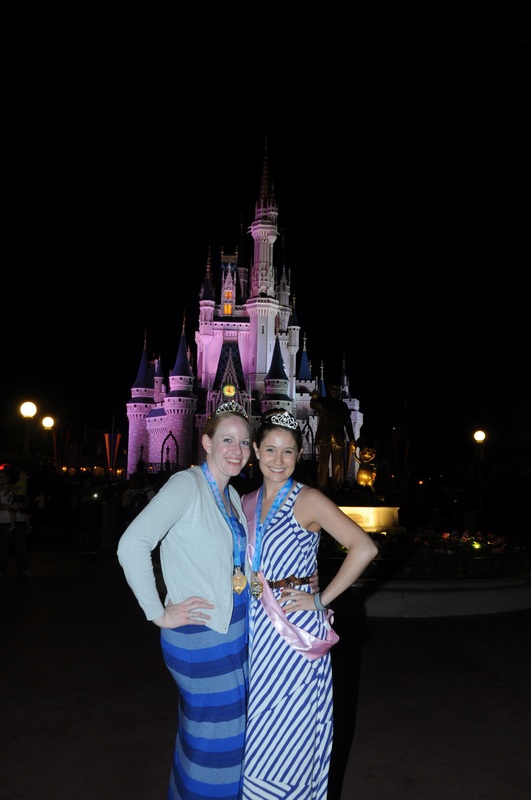 Afterwards, we were able to snap a few more photographs, head back to the hotel for Mickey Mouse waffles, get cleaned up, and return to Epcot with tiaras and medals (we left the tutus at the resort this time). Again we meandered through the park, enjoying some of our favorite spots (including Figment, adorable! ), took pictures with Belle (my trip was complete!! ), and sipped on some Snake Bite Blacks from England. We ended the day with the Illuminations fire work show (my favorite! ), and traveled back to the Magic Kingdom for Space Mountain, Under the Sea, and pictures with the illuminated castle. 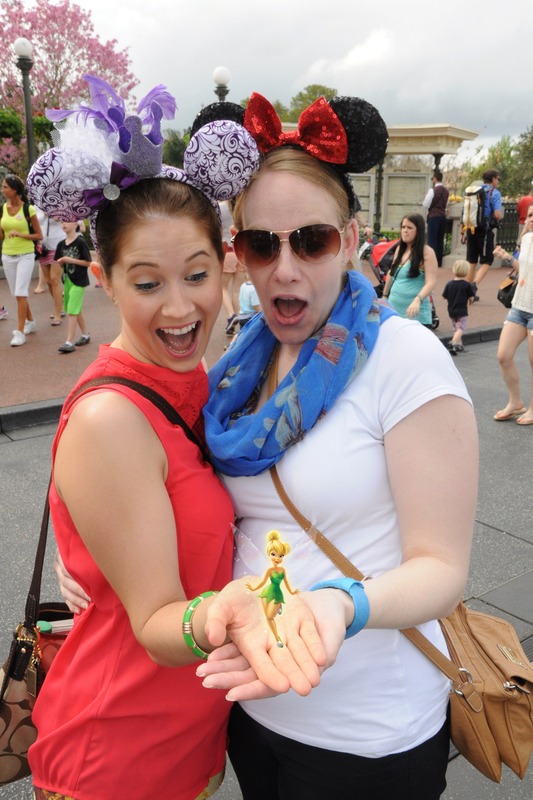 It was the most perfect princessy weekend ever imaginable. I wouldn’t have changed a thing. Great end to a magnificent day! Ain’t no Party like a Fresh Foam Party! Last night I attended the launch event for New Balance’s Fresh Foam 980. I have to say, I am not usually all about these events, having to deal with corporate folks swarming like vultures waiting for you to say something mildly positive about their product so they can immediately tweet about it, but I do love some giveaways and free loot. I also have fallen deeply in love with my New Balance 3190s. 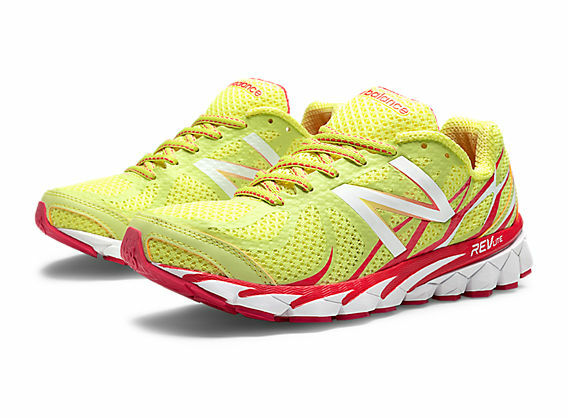 Not only do they feel like running on air, but they are bright yellow and hot pink. They are the perfect complement to my Belle running outfit for the Disney Princess Half Marathon (TEN DAYS YAY!). Obviously. I will be revealing my carefully planned ensemble soon. It’s going to be FAAAAAABULOUS. My 3190s are pretty much the greatest thing since sliced bread. So after work I headed to the New Balance store in Littleton, Colorado. This was one of six stores selected across the country to host a promo party. I do wish they had incorporated a bit more excitement like the shop in Chicago with their 3 mile fun run and foam pit, but it was a good event regardless. My sales associate, Mike, was incredibly helpful. He measured my feet, utilized a foot pressure plate to determine the pressure points in my feet, fit me for athletic inserts, and although he recommended the new Fresh Foam 980, he also recommended a few other models as well. I didn’t realize before, and this could simply be a major lapse in my understanding (so forgive me if this is common knowledge), but New Balance was founded in 1906 and originally provided arch support products to police men, fire men, and laborers. This explains why a major element of their brand is consideration of pressure points, arch support and examining the effects of a body in motion. They didn’t actually release their first running shoe until 1938. I had always poked fun at my hubby for wearing the old school New Balance shoes. They are, after all, very collegiate, and here we are approaching 30. But for an athletic shoe, I will never scoff again. I love the spaciousness of the toe box, the comfort around the heel and the lightness of the shoe. 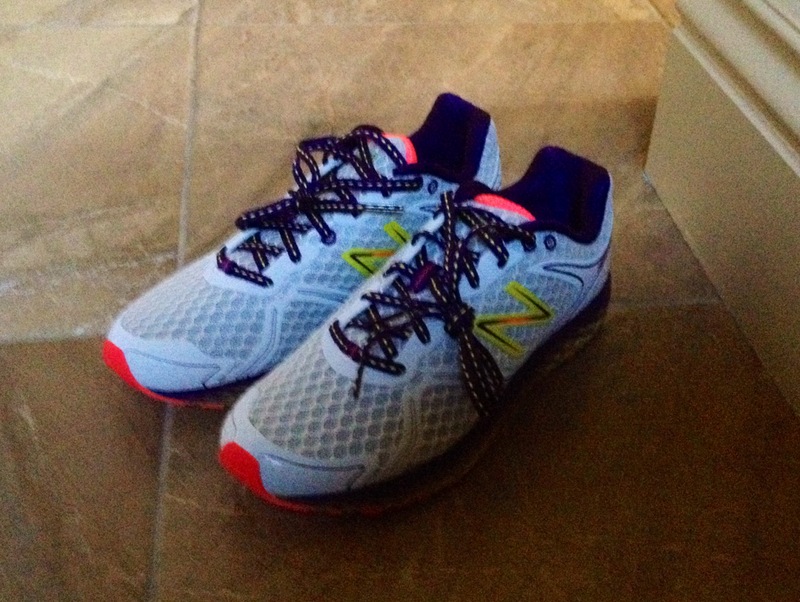 I crave a shoe that is simultaneously sturdy and lightweight, and New Balance delivers. After testing out the Fresh Foam 980, I am sold. 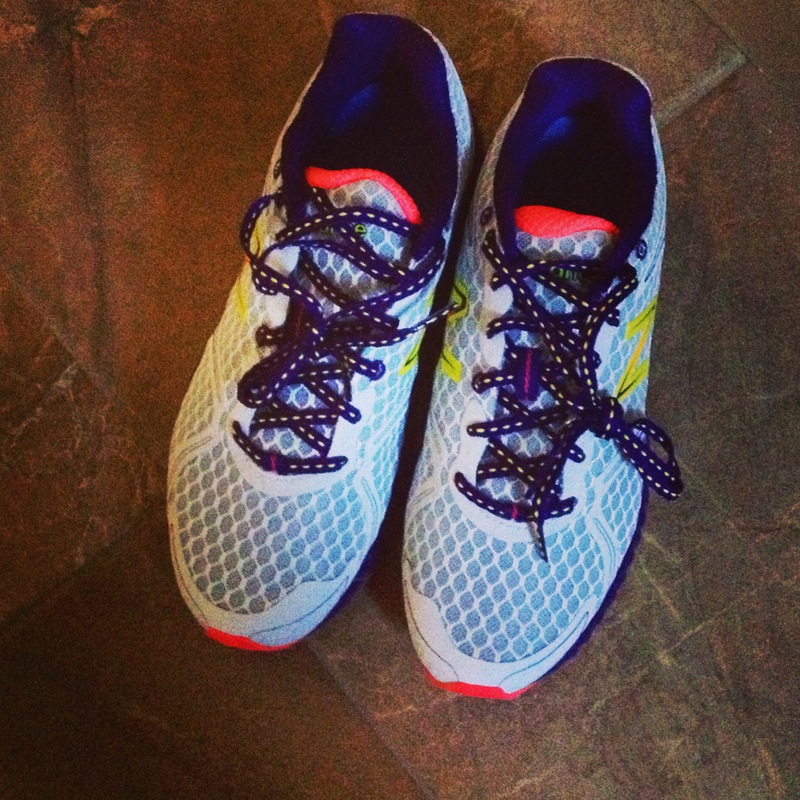 Given the 4 millimeter drop from the heel to toe, it takes some of the work out of running. I know that sounds highly counterintuitive and lazy on my part, but it allows you the freedom to not have to think about your feet whilst running, and keeps your feet closer to the ground. It’s a more natural stance, and that’s a great and ingenious improvement. I was also personally looking for a shoe that could withstand many miles without feeling weighty. This shoe performs. The foam is light, but shock absorbent and durable. Of course only time will tell how the shoe wears, but I have high hopes. Aren’t they fabulous? The color is purple cactus flower with neon yellow. The event wouldn’t be complete without a little swag, so after loading up with new socks, a running shirt, and the most glorious athletic pullover (um, hello, a zip up with a hood that has a hole for your pony tail!! ), I got a free NB string backpack (can’t wait to use it for my Zumba class! ), t-shirt (which actually came in size small, halleluiah), a beaker (it is the science of running, after all, although I did have to ask the significance), and a #Freshfoam marshmallow (Hahahaha! Oh, punny!). Overall, I was pleased with the event, the product, and the freebies! I’ll be going back this weekend to get the hubs a new pair. He probably never thought I would be taking him to the New Balance store, especially with such excitement. Can’t wait to wear these for the Nike Women’s Half in April (ironic, I know, but oh well). 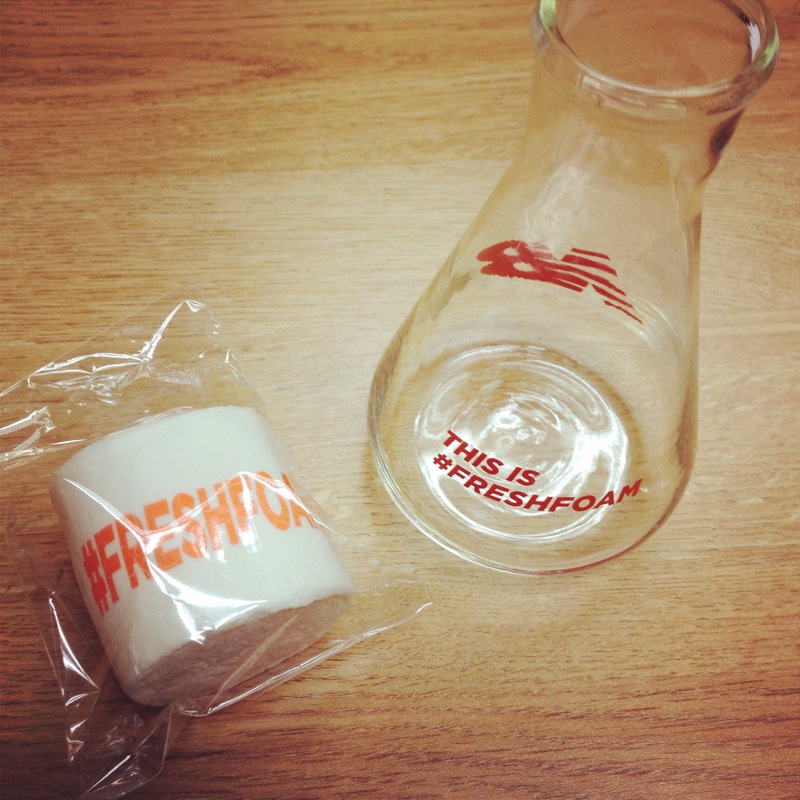 Giant #Freshfoam marshmallow and beaker! So I realized in my early days of running, as in last year, that footwear is the single most important thing you can do to ensure successful, safe, and comfortable running and training. Clothing matters, but the shoe is king. Which is perfect because I LOVE shoe shopping. So a friend of mine recommended Asics and that has been primarily the brand I have gone to ever since. I have narrow feet and ankles, but I need a wider toe box. I’ve grown up having issues with my feet, so finding a shoe that fits perfectly, provides lasting support, and doesn’t cause pain is a pretty phenomenal feeling. 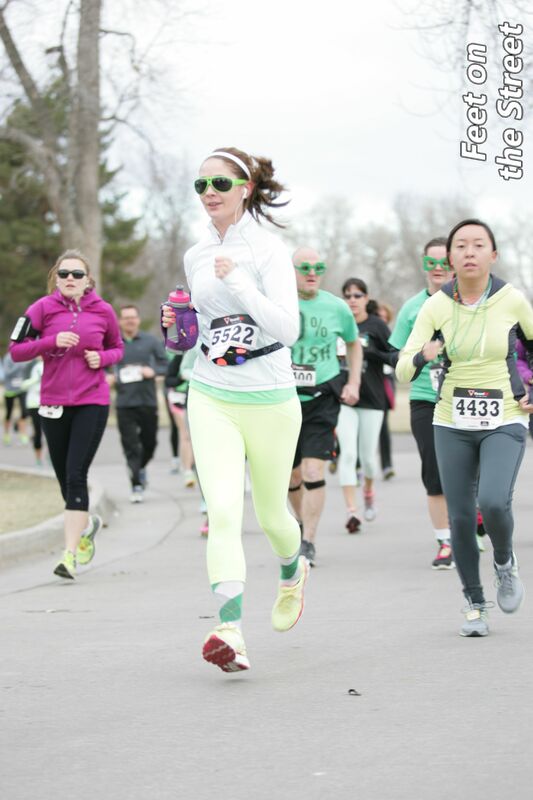 I ran my first race in Asics and I am so grateful I did! Look at me go in my schnazzy shoes! 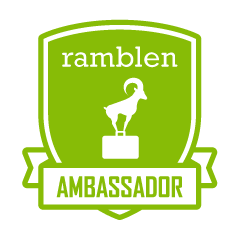 If you are in any way considering a new brand, they are one I respect, they have quality items, and the fit and feel are consistently good. So now you’re in luck, and you can thank me when you win, because Asics is having their Gear for the Year Sweepstakes. $5000 worth of Asics gear could be yours! Enter daily through March 31st! I love spreading the word about deals and sweepstakes (what can I say, I love getting a lot for, well, nothing, but at least very little), so be prepared. Giveaway Wednesday has a nice ring to it… too bad I don’t have anything to giveaway!